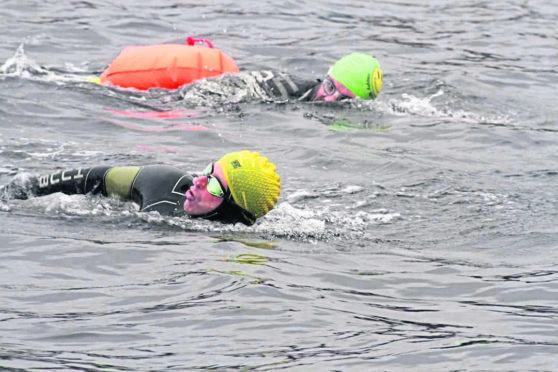 Colleen Blair, 39, from Perth, Colin Macleod 46, from Stornoway and Norman Todd, 46 were aiming to swim across the Minch. 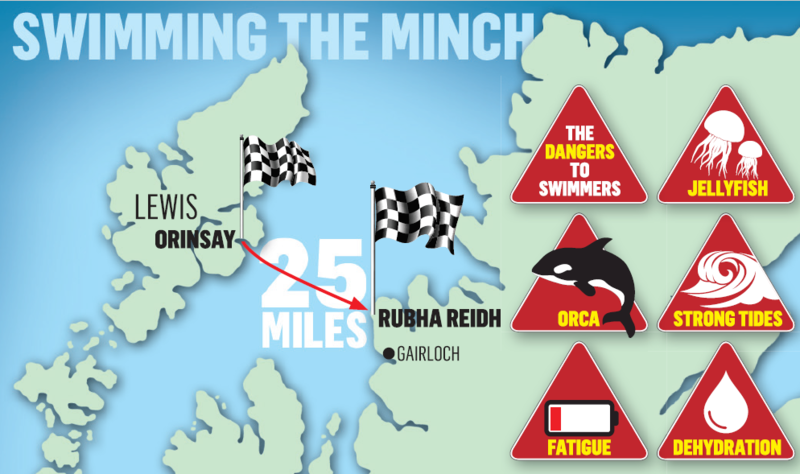 Three long distance Scottish swimmers are to attempt a 25-mile crossing of the Minch – hoping to become the first ever to complete the swim and defeat swarms of stinging jellyfish. Colleen Blair, Colin Macleod and Norman Todd are well experienced and hopes are high that they will be able to complete the trip from Orinsay on the Isle of Lewis to Rubha Reidh near Gairloch in Wester Ross in 15 to 18 hours. They will be supported by a small flotilla of boats and kayaks and their challenge will begin tomorrow. Confronting the swimmers will be fatigue, dehydration, strong tides, the possibility of Orca appearing alongside, and the stinging lions mane jellyfish that have plagued previous attempts. Numerous attempts to swim across the Minch have been made but, as yet, none have been successful. The most recent bid was on Monday night when South African swimmer Phia Steyn had to abandon her swim after four hours due to multiple jellyfish stings which left her in hospital. Mr Macleod is already experienced in the choppy waters between the mainland and the Western Isles after swimming the 17-mile Little Minch earlier in the year. Unlike her two fellow swimmers who will be wearing wetsuits, Colleen Blair shall only be wearing a swimsuit. She is regarded as one of Scotland’s top long distance swimmers and swam the English Channel at the age of 20. She then went on to join the select few to have swam the Northern Channel between Scotland and Northern Ireland as well as being the first to cross the Pentland Firth. She said: “The Minch swim was suggested to me 20 years ago by a college friend who was from Lewis – the idea has intrigued me ever since. “I started to plan this swim three years ago but for various reasons including the weather the opportunity has not risen until now. “When the guys offered me the opportunity to swim with them I couldn’t refuse – it’s also in aid of great charities.